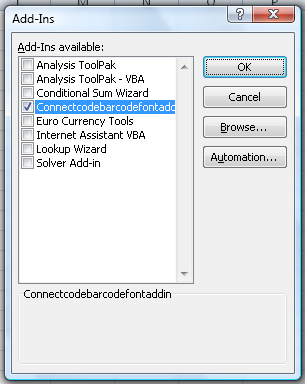 ConnectCode offers an Excel addin that simplifies the creation of multiple barcodes within Excel. 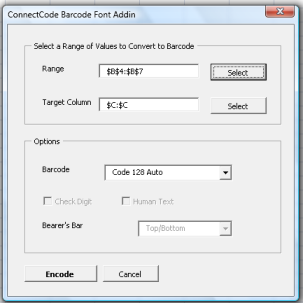 If you want to avoid the hassle of using of VBA formulas in Excel when generating a large number of barcodes. , you will find the Add-in for Excel an excellent alternative. 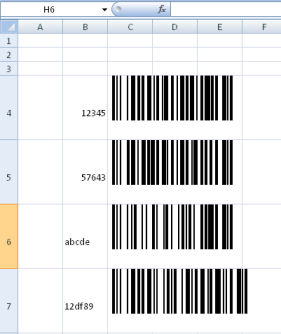 Click the Select button to choose a column of data to convert into barcode. Choose the desired Barcode Symbology, and click the Encode button. A barcode will be generated for each row of data as shown. The add-in is an optional installable item. It is located in the /Resource subdirectory of the trial package and is named ConnectCodeBarcodeFontAddinTrial.xla. You can manually install the toolbar into Excel 2003 (using Tools->Add-Ins) or Excel 2007 (Office Button->Excel Options->Add-Ins->Manage Excel Add-Ins->Go) through the Add-Ins dialog. The details are given in the help file of the trial package, which provides a step-by-step guide to the installtion process.